The Dunsmuir Railroad Depot Historical Society’s Dunsmuir Museum and its Railroad Display Room have closed for the winter months; they will reopen April 2015. Be sure to visit us on line for the latest information. We are saddened by the passing of Anthony Skalko, Depot Society President. Tony attended one of the very first meetings to save the Dunsmuir Amtrak Depot. His leadership was filled with work and enthusiasm for the Dunsmuir Depot and Museum, the Depot Society, and especially the town of Dunsmuir. He will be missed. May 3rd was the Grand Opening of the Dunsmuir Museum with a ribbon cutting. The Museum tells the story of the Native Americans, the coming of the railroad, the establishment of the town and the railroad facilities. Of special interest is the Elinore Van Fossen Harrison Native American Basket Collection donated to the Museum. A 1950-1963 arrowhead collection on display was loaned by the Dennis Family. The “Golden Era of Fishing” exhibit is also featured. May 10th – National Train Day was celebrated nationwide to commemorate train service. We were open and children were given paper Amtrak hats and coloring books. May 24th 6th Annual Pie Social during Dogwood Daze had 71 pie bakers donating 43 different pies (total 190) from 15 cities; we were sold out by 1:30 pm. Thanks to the pie bakers, the crew, and pie lovers. June 13-15 was Dunsmuir Hometown Heritage Celebration. We had over 200 visitors at the Museum and Railroad Display Room. June/July Dunsmuir’s Pat O’Connor brought two “A Boxcar Children Adventure” Road Scholar tour groups to the Depot. The children and their grandparents toured the Dunsmuir Museum and were treated to a crew change/freight train stop at the Depot. Train coloring books and Conductor hats were given to the children. July 19th Depot Ticket Drawings saw Chuck DiPrima of Anderson and Dunsmuir winning the two Coast Starlight tickets, Kit Bradford of Dunsmuir won the “Mystery Quilt”, and Jade Scysen of Weed won the “Fly-fishing Guys Quilt” with a ticket bought by her Grandmother! Thanks to all who participated in our drawings. October 11th – Two Dogwood trees, donated by family and friends, were planted overlooking the rail yard to honor Past Presidents Rita Green and Anthony Skalko. City Manager Allan Harvey and Mayor Dave Kiesler spoke at the dedication. See enclosed news article. October 18th Art Walk – The Museum and Railroad Display Room were open for the town event. Depot member and local artist, Joseph Vella, was featured. Joe painted the 12’ mural of #1727 Locomotive on the Museum wall. Thanks to Joe, Mario Rubino and Steve Rice for their good works. The mural is stunning! See enclosed photo. DUNSMUIR MUSEUM – The Museum and the Railroad Display Room exhibits have been completed. Future exhibits will be worked on. The Shasta Archives folks have worked on a regular basis this summer. The original field survey books, bridge inspection books and other books are now shelved. Flat files now house maps and plans originally stored in boxes. 680 negatives and photos have been scanned and identified as to location, railroad mile post, only 6 to 7000 left to do. We are looking for Museum Docents as we would like to open the Museum the first and third Saturdays monthly. That’s only 14 times a year – hours 10 am to 2 pm. Please call 235-0839 to indicate your interest. Come to learn about your town, and we can learn about your Dunsmuir history too. We will have a Docent Training Day in spring so call now and leave your number and we will contact you with a date, time and place. MEMBERSHIP – Dues are due for 2015. Your $10 Depot membership check and your $10 Museum membership check may be sent to the Depot Society, P O Box 324, Dunsmuir CA 96025. Please fill out the enclosed Membership/Donation form so we know how you want your donation applied. Should you wish to receive your Depot newsletter electronically, add your email address or email dunsmuirdepot@gmail.com. All donations are welcome. 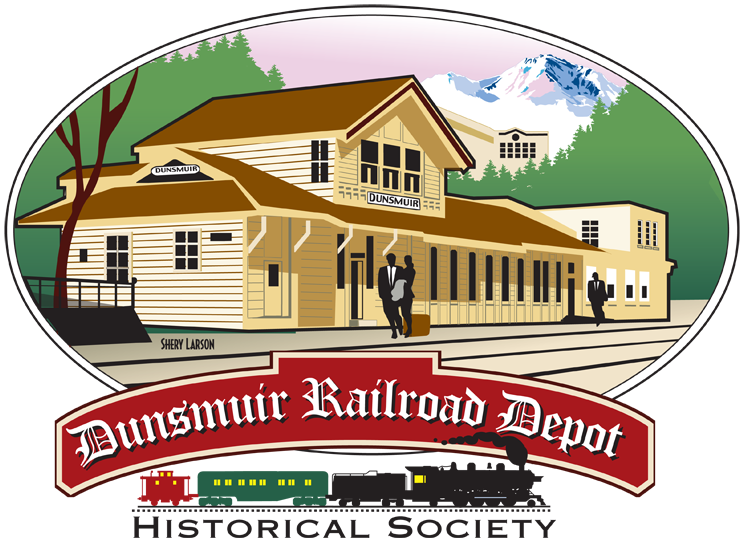 Your memberships continue the maintenance of the Dunsmuir Depot, the Dunsmuir Museum and its Railroad Display Room. Thank you once again for your continued support. Previous Last chance to see the museum & display room before they close for Winter!